Editors Note: We are not being compensated by Keepa to endorse their product, nor do we have any sort of affiliate relationship. We are simply very satisfied users who want to share this great product. Keepa is a very simple tool that helps you save money when you shop on Amazon. 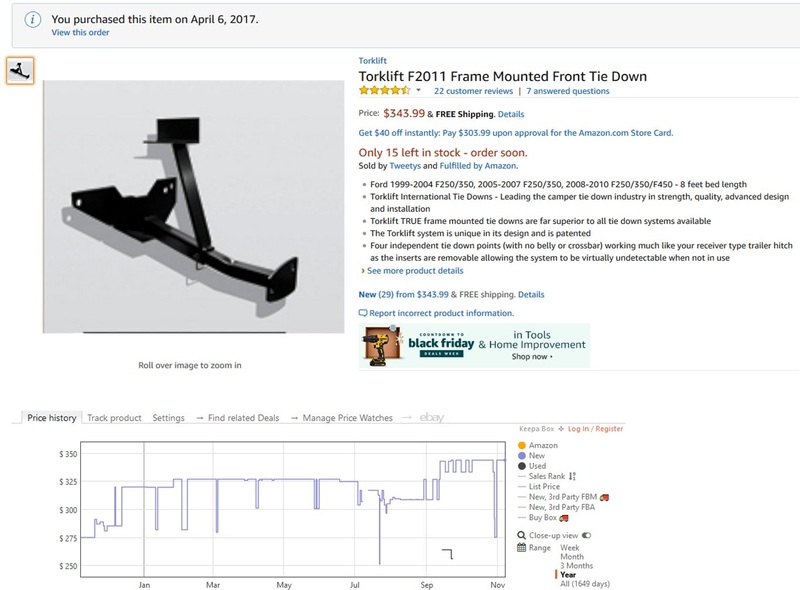 After you install the extension (available here for Chrome or here for Firefox) it will automatically insert a line graph of an item's price history into it's Amazon listing (it also does price alerts and other things, but we haven't used any of that). That may not sound like it will save you money, but it does. I will explain how using a real purchase we made. After buying a truck and a camper, I needed a way to attach the two of them, and decided a product made by Torklift was the best option. It's price was $327 pretty much everywhere, including Amazon, and I needed it for an upcoming trip, so I was prepared to bite the bullet and spend the money, until I looked at the Keepa graph on the Amazon page. The price seemed to go down for a short time at the beginning of every month. It was the end of March, so I decided to wait a few days and see if the price would go down again soon. Not only did it go down, it went down significantly. The normal price at the time was $326.99 but it went down to $254.30 and I pounced on it. That equates to a savings of $72.69 on a single purchase, all thanks to Keepa. Since that purchase, Keepa has saved us money on a number of occasions, and I am thankful for it every time I'm shopping on Amazon. Do you have any tips for saving money online? Let us know in the comments. Another way to actually save money online is to use Ebates. 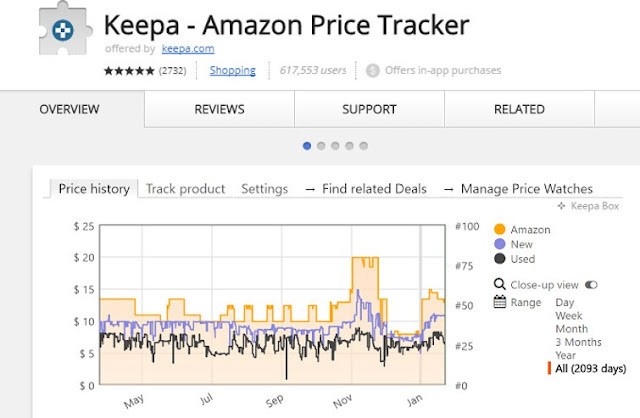 In addition to Keepa, you can use Ebates to save money at Amazon and thousands of other sites. All you have to do is navigate to one of Ebates' partner merchants through the Ebates site and you will get cash back when you place an order. It's totally legit and it couldn't be much easier. If you sign up now, you will get a $10 bonus after you make your first purchase. Love the tool! I am with you on too many apps and logins. But I will definitely be using Keepa. Thanks for sharing!